The must see places in Rome never come to an end, that's true. However these four will definitely be a breath taking experience. 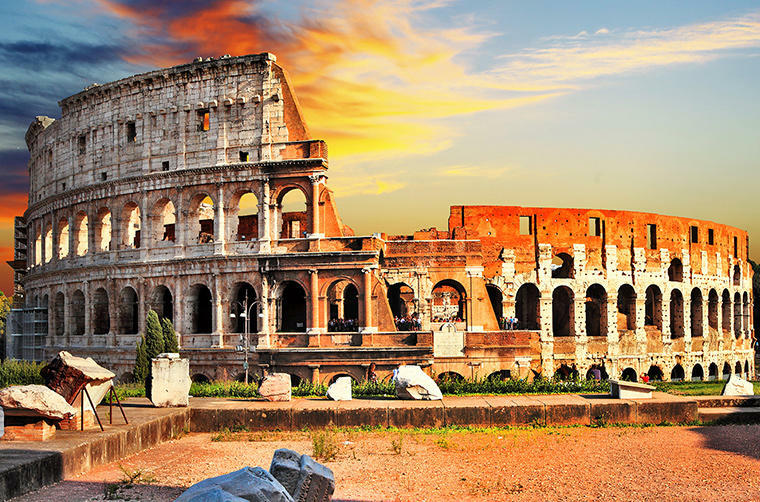 A trip to Rome is never complete without visiting Colosseum, also known as the Flavian Amphitheater. This giant amphitheater, made of stone and concrete in 80 AD, is thought to be the greatest work of Roman architecture while keeping its record for being the biggest amphitheater in not only Europe but also throughout the world. Colosseum is located right in the center of Rome. When you get off the subway and follow the stair that direct you to outside, you may have hardship to comprehend you are actually right in front of this magnificent building that has been quite good at challenging time. It is almost always crowded; having a Rome Pass will save you from waiting the long queue. The amphitheater is capable of holding 50.000 to 80.000 people who used to gather there to watch to gladiator contests or animal hunts and sometimes dramas. Although it has been damaged visibly because of the massive earthquakes, a big part of the structure is still in a good shape and preserved strictly. It is the undeclared symbol of the Roman Empire. It is located on Piazza del Colosseo, 1. You can get more information about visiting the place from the official website of Rome Info. If you are one of those who cannot get enough of the historical sites in Rome, then you must include Pantheon in your list of must visit places. It is one of the most well preserved Ancient Rome buildings and one simply cannot help appreciating the beauty and the elegancy of the architecture. Pantheon was actually built as a temple to dedicate the Pagan gods of Rome. The historians believe the construction and completion of the building had taken place between AD 118 and 125. Although the everyday purpose of the building has never gained clarity, it is possible to say that the architecture style of Pantheon has nothing to do with the traditional Roman architecture. One of the reasons why it has been preserved as the way it was built in the first place is it was given to Pope Boniface in AD 608 and has been used as a church since then. Pantheon is located on Piazza della Rotonda in Rome and can be visited from 09:00 AM-06:30 PM from Monday to Saturday and 09:00 AM-01:00 PM on Sundays. Are you ready to see one of the most famous sculpture fountains not only in Europe but throughout the world as well? If you are, just head to Piazza di Trevi and indulge yourself with the beauty of art and inhale the romantic atmosphere that surrounds it. Fontana Di Trevi, also known as the Fountain of Love in English, was built by Nicola Salvi but finished by Pietro Bracci. The architecture style is Baroque and it rises almost 27 m high from the ground. It is common for the visitors to throw coins to the fountain, it is more like a tradition actually. Don’t hesitate to do the same and make wish while doing. They say the coin must be thrown from your left shoulder. The estimated amount of the coins thrown every day is around 3.000 Euros. Visiting Vatican Museum is usually considered to be one of the most tedious version of sightseeing in Rome however you must know it definitely is worth it. Not because the city state Vatican is located far from the city center (because it is actually highly accessible) but because of the massive queue that seems to be permanent no matter which day of the week or what time of the year you visit the place. In addition, you will be accompanied by thousands of people. However don’t be discouraged by these because what awaits you there is simply soul feeding and mind blowing. The sculptures and pieces included in the museum are selected by the Popes throughout the centuries and they are truly an extensive interpretation of art, even as a word. Museo Pio-Clementino, Museo Chiaramonti, Museo Gregoriano Etrusco and Museo Gregoriano Egiziano are four of the museums included in Vatican. The famous Sistine Chapel is also in the museum, where you can see the amazing art of Michelangelo on the ceiling. There are rumors that the art pieces are affected negatively because of the visitors talking, lack of fresh air and even because of the constant human movement inside the authorities are thinking about closing the museum for the visitors and are working on a huge virtual tour. It is not still known whether this will be true but that’d be good to see the place when you still have time.